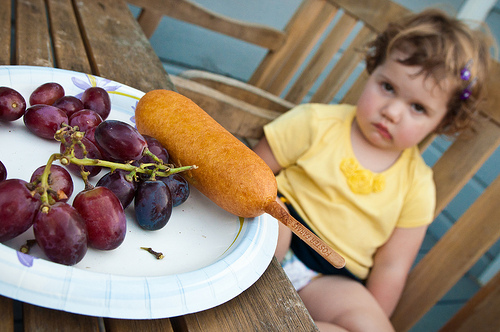 Why children love to eat junk food and shun away from healthy food? Running out of ideas what to do with the veggie-haters? If you have one picky eater at home, read on. Everybody knows fruits and vegetables are good for children’s health. And they are natural healers (and inhibitors) for common diseases. And numerous researches also prove that they can even help you ward off critical illnesses such heart disease and cancer. The problem: your child runs away faster than a cheetah when being served with plant-based, unprocessed foods (also known as healthy foods). There’s one simple solution to this problem. In fact, it’s not as difficult as you make it up to be. Remove all junk foods from your fridge and kitchen. Replace with fresh produce, nuts, seeds and grains. Just by doing this alone, you grant the picky eater the right to be picky. And for the first time, you are not worried about the pickiness. Because regardless of what your child chooses to eat, it’s all healthy. I said simple but it’s not easy. At the beginning, you will have to battle it out with your child during the transitional period. After that, things will be looking bright. To win the initial battle, you don’t need to use force, coercion, or anything that creates tension between you and the child. Nothing of that nature but it works like gangbuster. It’s based on the principle of natural consequences. Also in the same section, you’ll discover what foods I put on the family table that help raise disease-free children. And what foods I get rid of.